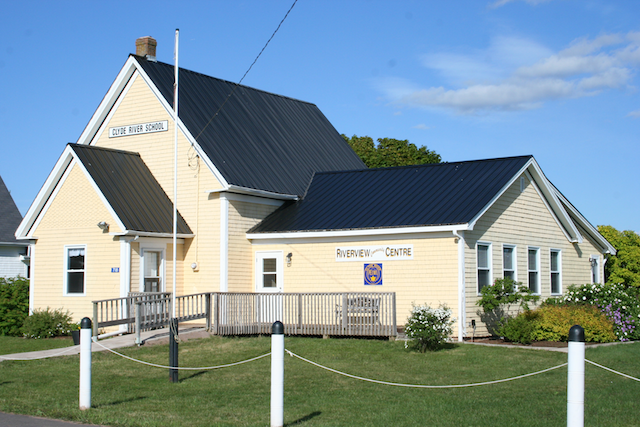 The Riverview Community Centre is owned by the Clyde River Women’s Institute. This building, the former school, has sentimental value for those who went to school there. The Women’s Institute, with the help of many residents, work hard to continually update and improve this facility for community use. Updates to the Centre have involved several grant programs over the years including a recent New Horizons for Senior’s grant through which a new stairwell to the basement was built and a vapour barrier, insulation and gyproc were applied to the basement walls. A Humidex was installed to ensure good quality air flow. This Centre is the only common-space building in the community. The Community Council uses this building for its meetings and supports its upkeep. Now, the Clyde River Community Council, in partnership with the Clyde River Women’s Institute, is embarking on a major renovation program in partnership with Skills PEI and the Island Community Fund, both with the provincial government. The Central Development Corporation has been helpful with the many logistics necessary to make a project such as this work smoothly. This project is slated to begin in late September and will be 12 weeks in length. On the exterior, the Community Centre will be enhanced with new shingles and paint and the front entry will be made safer with a portico. On the inside of the building, more work will be done to complete the basement area, and the kitchen area will be modernized. There will also be an outdoor storage shed that will be wired for a generator for emergency preparedness. This project is an incredible opportunity for the community of Clyde River, and we are very grateful to the parties. The funders of the program are Skills PEI (through the Canada/Prince Edward Island Labour Market Development Agreement), the Department of Fisheries, Aquaculture & Rural Development and the municipality of Clyde River. Hopefully, the Apple Pie Festival, planned for the last of October 2011, is as successful as other years, and if so, the profit will pretty much cover the community’s 10% share.